Westatlantic Tech Corp. is a leading supplier of industrial heating wraps and cover jackets. We ship Canada wide and to the Northern United States. We select heating wraps, engineered and designed for controllable heating and industrial capacity. Pipe protection systems designed for pipeline projects. Pipe cover wrap protectors are the preferred mobile power heat systems for industrial applications. This basic system is used in many other freeze protect applications. Pipe heater wraps are engineered to withstand the harshest outdoor environments, or in any application where pipe freezing may occur. The pipe protectors are a two part system, allowing the inner pipe heater cover to be installed in direct contact with the pipe. 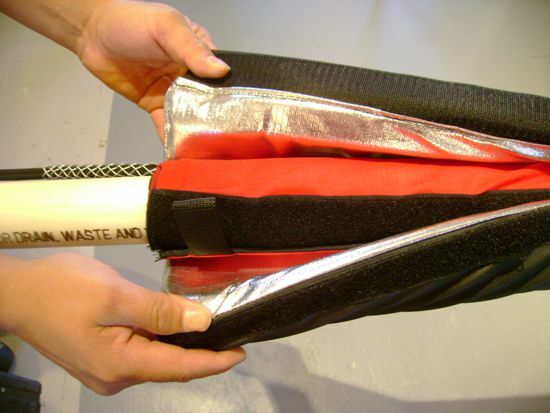 The secondary outer layer pipe insulation jacket is made of closed cell foam. The inner portion of this secondary cover has a heat reflective aluminized Kevlar layer and an outer PVC exterior. Making it a durable, water-proof, Arctic class insulator heat protection system. This highly mobile, quick install - un-install pipe protection system, allows the power wraps to be used in problem areas quickly. It is a first choice cost effective method for pipeline protection. During pipe by-pass operations the blankets allow protection of the by-pass pipe while main trunks are maintained. Pipe Heater wraps are custom supplied for any sized pipe diameter and measure. 120V or 240V power supply units available. C1 Division 2 connectors may be used for the system. Fluid Freezing in a pipe results in a ice plug that acts as a fluid block. Freezing is accomplished using liquid nitrogen. When down stream maintenance or rehabilitation on the pipeline is required, the ice plug may be required in place over the course of several days. The innermost layer of this system is a Thaw Blanket, while the outer most part is an insulating system. The blanket heat system is dormant throughout the Freeze and withstands the Cryogenic cold temperatures until it is activated. Once the down stream repair is completed, the ice plug needs to be melted and the thaw blanket portion is activated and heat is applied to melt the ice plug. These application specific Thaw Blankets dramatically reduces the time for the ice plug to be melted. The pipe line is allowed to go back in service, in a safer manner by metered thawing of the control ice plug.